Good morning! A lot of exciting things going on today. 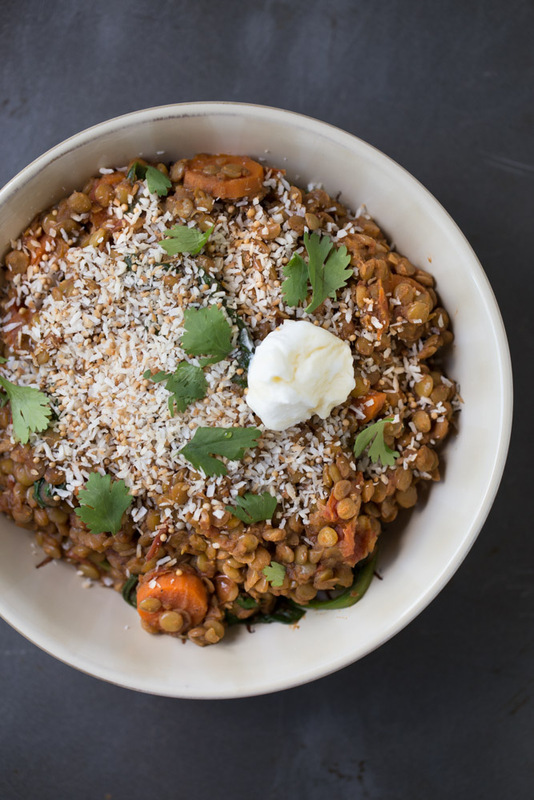 Like these Spiced Lentils with Toasted Coconut. And my pal Zainab from Blahnik Baker’s virtual baby shower! Do you know Zainab? If not, you totally should get to know her. She’s one of the sweetest bloggers I’ve ever met. She bakes great desserts. And she’s having a baby boy! 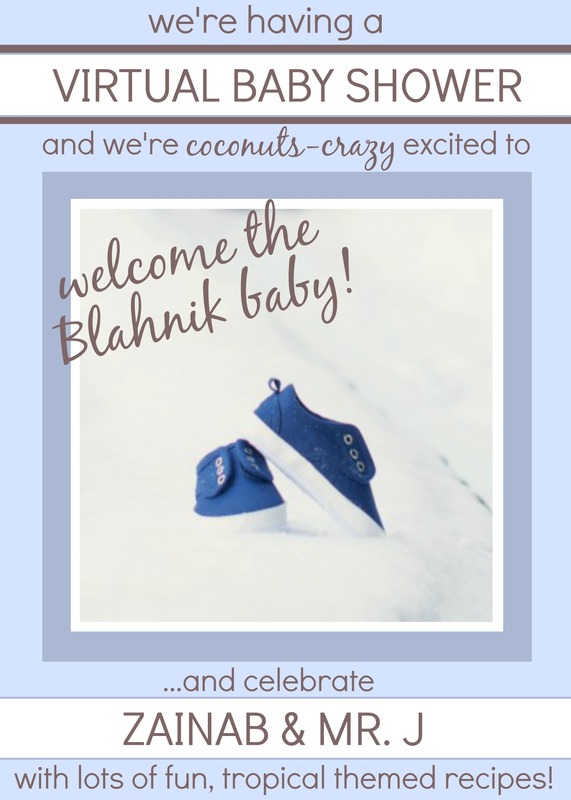 In honor of her little bundle of joy who will soon make his presence, some of Zainab’s blog pals and I got together to throw her this surprise virtual baby shower. She loves coconut so coconut was a must in the recipes. I decided to bring a delicious, full of flavor main dish to the party. Gotta have some savory with all of the delicious sweets, am I right?! I adapted this Spiced Lentils with Toasted Coconut recipe from the Food 52 Genius Recipes cookbook. The main changes I made were to use garam masala in place of curry and I added fresh spinach, carrots and heirloom tomatoes to the lentils as they were cooking. The resulting meal is hearty and full of wonderful flavor. The lentils can be served with brown rice or sweet potato noodles. It’s a filling meal that’s perfect for a family, a couple, singles and serving to guests. It’s also a great option to bring to new moms because it can be easily reheated! After the recipe below, you will find links to all of the other coconut filled recipes that were brought to the virtual baby shower for Zainab. You can easily click through to visit each recipe. Enjoy! Melt the butter in a large saucepan. Add the shallot, garlic and garam masala and cook over medium high heat until the shallot is tender, 3-4 minutes. Add the lentils, carrots and tomato paste to the saucepan and cook for 2 minutes. Add the heirloom tomatoes to the saucepan and then fill with enough water to covers the mixture by ½ inch. Bring to a boil and then reduce the heat to medium low and simmer 30-40 minutes or until the lentils are tender. Stir in the spinach and cook 3-5 more minutes or until the spinach is wilted. Prepare the toasted coconut. Place the coconut in a skillet with the mustard seed and a pinch of salt. Toast over medium heat for 3-5 minutes, stirring often, until the coconut is slightly toasted. Spoon the cooked lentil mixture into serving bowls and top with the toasted coconut. Garnish with plain Greek yogurt and cilantro, if desired. The lentils are great served over brown basmati rice or sweet potato noodles. Check out all of the other delicious coconut recipes by visiting the blogs below! This is seriously beyond amazing! I adore lentils! I love that you went savory! And so smart to think ahead about it being good for a new mom. This dish sounds fantastic and I’m totally craving it for lunch now. Thanks so much for being a part of Zainab’s virtual shower- she is over the moon! Oh good some savory to cut through all the desserts! IDK why I didn’t think to make a savory recipe for today but I am definitely liking this. I don’t think I’ve ever cooked with lentils before but this may be the chance I need! Oh I loved that you threw a savory recipe in the mix. I want to stuff these lentils into some tacos. That sounds delicious! Yeah for Zainab and her growing family! Wow this sounds so good! Love the toasted coconut in there. Congrats to your friend! Love that you went savory for the coconut theme, so cool! Pinning! I’ve never even thought about this flavor combo, very intriguing. Gorgeous! 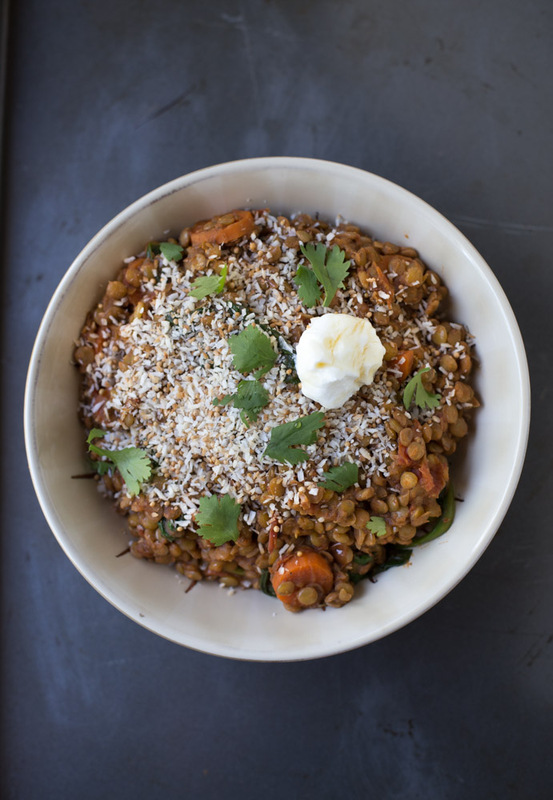 This lentil dish looks like the perfect dinner, love the idea of adding toasted coconut! Oooh I love this savory idea with coconut! Nice dish! Must have been really flavorful! This sounds so good, Julie! I love lentils and such a great idea of adding coconut. Yay for making a savory dish for Z’s shower too. Love this! what a creative use of coconut!! Definitely need some savory with the sweet, so this dish was the perfect thing to bring! I love coconut in savory dishes, and this sounds delicious!